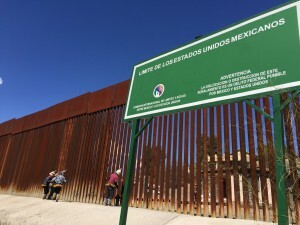 Miller, author of Border Patrol Nation: Dispatches From the Front Lines of Homeland Security, just wrote the piece “No Need to Build The Donald’s Wall, It’s Built,” for TomDispatch.com. The piece states: “Donald Trump’s United States doesn’t await his presidency. It’s already laid out before us, and one place it’s happening every single day is in Tucson, only seven blocks from my house.” The piece tells the story of Ignacio Sarabia, who tells the judge that he was trying to visit his infant son, who is about to have heart surgery and is a U.S. citizen. Miller’s past pieces include “Why Is an Israeli Defense Contractor Building a ‘Virtual Wall’ in the Arizona Desert?” for The Nation.